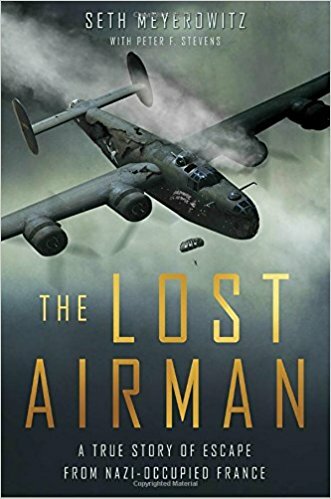 On THURSDAY, April 6th at 7 PM at the Millburn Free Public Library, Seth Meyerowitz will discuss his book entitled The Lost Airman. For fans of Unbroken, this is the remarkable story of World War II American Air Force turret-gunner Staff Sergeant Arthur Meyerowitz, who was shot down over Nazi-occupied France and chased by the Gestapo. Rescued by the French Resistance, he had to pretend to be a deaf and mute to aid in his escape for freedom to Allied lines. His ordeal lasted for over six months, during which he was captured. Seth Meyerowitz is the grandson of Arthur Meyerowitz and detailed the account in his riveting book, which he will present at Thursday's meeting.